A vitamin e overdose is for the most part rare. However, some individuals are not careful and may not follow a physician’s instructions carefully on the proper dosage to take. 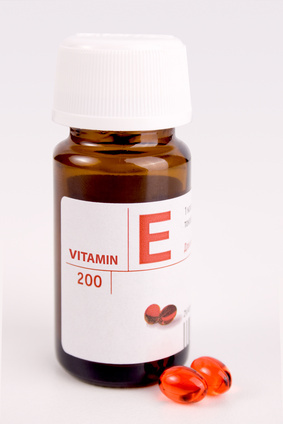 In their haste to correct their skin care problem or health problem, individuals may take too much vitamin e. Because vitamin e is a fat soluble vitamin, it may accumulate in the body more so than a water soluble vitamin such as vitamin C.
The symptoms of taking too much vitamin e or vitamin e side effects are broad and may reflect many other health problems other than an overdose of vitamin e. Check with a physician immediately if you suspect that you have overdosed on vitamin e and to ensure there is no underlying illness causing the symptoms. Symptoms of an overdose or vitamin e side effects can include the following: abdominal pain, more than the normal amount of abdominal gas, nausea, diarrhea, fatigue, weakness, headaches, blurred vision, and internal bleeding due to depress blood coagulation if the overdose has been occurring over a long term. Some women taking vitamin e have reported emotional disturbances as a side effect of taking vitamin e supplements. Also, high doses of vitamin e can affect the absorption of some other vitamins, in particular vitamin a and vitamin k and subsequently cause a deficiency in these vitamins. Therefore, as illustrated by the side-effects listed it is important to not take more than the recommended amount of this or in fact any vitamin. The recommended dietary allowance (RDA) for vitamin E is low, 15 to 20 International Units (IU) per day. Some studies have examined vitamin e toxicity and have concluded that up to 1600 IU/d of vitamin E appears to be a safe amount for most healthy adults. This indicates that vitamin e toxicity is very low. On the other hand, other studies have indicated that a vitamin e dosage of 400 IU/d may cause some health issues. Therefore, it is important to consult with a physician when considering vitamin e supplements to help with skin problems or other health issues. Many experts believe that for vitamin e supplements, 100 to 200 IU per day is sufficient and more than that is not beneficial and may actually be detrimental to health.